Some of you know, and some of you don’t!! So, we’ve decided to tell all of you in one shot! Yes, our family will be growing!!!!! No, I’m not pregnant! 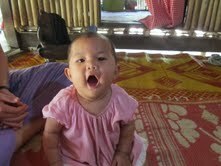 But, coming September 2, 2012, we’ll have a precious 1yr old girl in our care. It will only be for 2 months, but we believe this is just the beginning!! She is one of 200+ children at this “Children’s Home and Learning Center”. Many are orphaned, neglected and abandoned. The ages range from infants to 22yrs. Michael and I are finishing here in Korea and heading south to help the Adams family care for them. As the story goes, the Adams were drawn to leave their mountain home in the US and enter the mission field. India was their plan, but circumstances changed, and God led them to the Karen people living in obscurity in the mountains of Thailand. The Karen are a peace loving and gentle people, yet for over 60 years they have been hunted and killed by their own people in the land of Myanmar (Burma). Many still live in their country, but in fear of their lives. 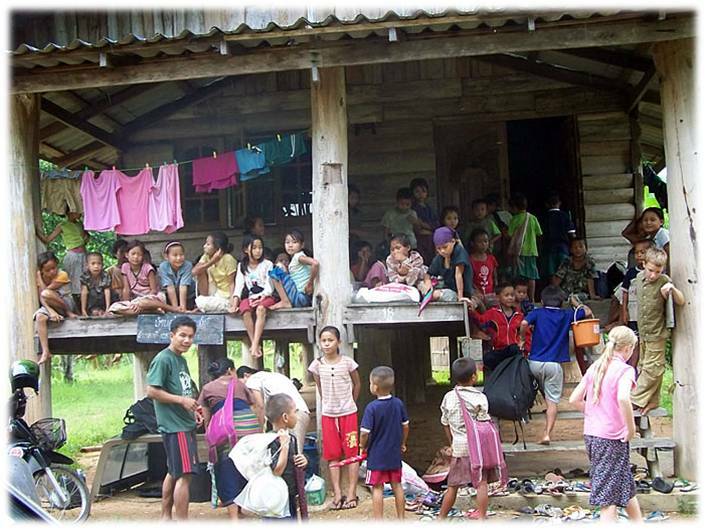 Others flee over the border into the mountains of Thailand in the hope of a better life. Some have lost their lives in the struggle. And some, in desperation, feel they need to abandon their children. Since 2009, the family ministry of the Adams’ has grown in leaps and bounds. 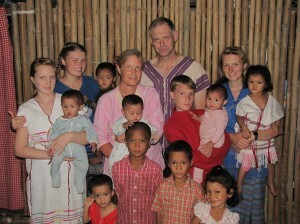 They have established a children’s home, a place where little ones have a mommy and daddy. There is a girl’s dorm and a boy’s dorm, housing most of the children. The learning centre is a place where they learn Bible, English, Math and other subjects. They also receive vocational training, in the areas of gardening, building, cooking, sewing, weaving and medical missionary work. As their home and property started bursting at the seams, God provided 100 acres of beautiful land across the road! Sunshine Orchard not only fills the needs of the children in their care, but they reach out to the surrounding villages, giving medical help and educating the people in disease control and healthful living, also bringing them the hope of salvation in Jesus. It is their aim to train the older children to be evangelists and medical missionaries. 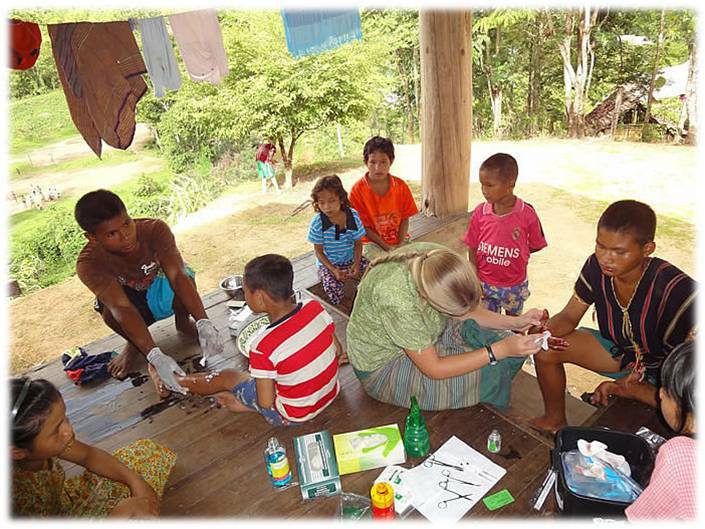 Starting September 2012, the Intensive Medical Missionary training course will begin. It’s a two year course, equipping the Grade 9 students for service back in their own villages, or wherever God sends them. We are excited to help in their training: Michael, with the Medical Missionary side, and I will teach them music – choir, singing, piano, violin, recorder, flute and the principles of Godly music!….. Please pray for me!! The needs are great; there is no church or governmental organization officially supporting this ministry. But we move on in faith. The Lord provides miraculously at every step. I hope to have a few pianos delivered to Sunshine Orchard, as they only have a rather undependable keyboard between the 200+ kids! 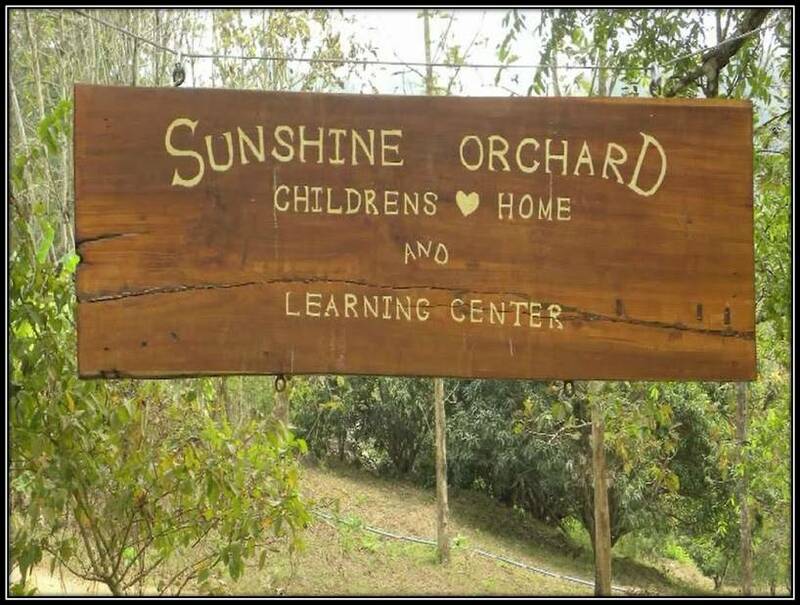 We will be the fourth family to move to Sunshine Orchard, besides the many volunteers who have come and gone. In 2011 the Steck family joined them, and in the next couple weeks the Sharon family will arrive. They have been ministering in Thailand for some time now. We fly in shortly thereafter, with NO experience in jungle life! Please keep us in your prayers as we venture out in faith. The comforts of home as we know it, will be no longer. Conditions are rather primitive; discomforts and disease abound in certain times of the year, and the nearness of impending war…all of these will be a school of learning to trust Jesus with heart and soul. “In whatever God does in the course of our lives, he gives us, through the experience, some power to help others.” (Elisabeth Elliot) It is our wish that we, too, will be a part of bringing help and comfort to an ‘oft forgotten people’. Wow, that’s great!! WIsh I was doing something like that. The kids are lucky to get you to do the music, Inge. God bless you both in your ministry. VERY exciting! Wens ons kon ook soiets doen! God will use you to bless them, and you’ll be blessed too! we wish you well, and will be praying for you both…Excited for you guys! Wow!what a blessing to be part of the team which has vowed to serve the Lord.Anywhere with Jesus you can safely go.Let this new chapter draw you two closer to Jesus.Be blessed.Will be praying for you friends.Lots of love. Wow Michael and Inge I am so happy for you! That is real love in action. Our Awesome God has truly led you into a real mission field! Enjoy the experience and I am sure you will reach many hearts for Jesus.